Cuming Microwave is the only full service supplier in the world offering a complete line of dielectric, artificial dielectrics, ray domes, RF absorbers and anechoic chambers for the international aerospace and electronics and defense industries. 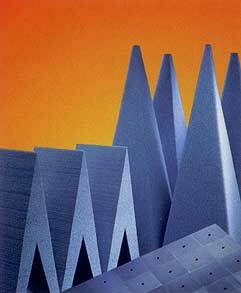 C-RAM HPA is a hollow pyramidal RF absorber designed to provide high levels of absorption in high power applications. Typical uses include the hot spots in test rooms or anechoic chambers where heating due to concentrated power might damage conventional materials or lead to danger of smoke and fire. Power densities of up to 15 W/in² have been handled successfully. C-RAM HPA is usually used with other products such as C-RAM SFC or C-RAM EVA in an anechoic chamber application. the frequency range of 30 MHz to 2 GHz. C63.4) and immunity (IEC 1000-4-3) testing. 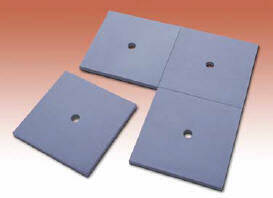 C-RAM ODP is a series of very high performance absorbers similar to C-RAM EVA. C-RAM ODP is made from a lightweight open cell foam with large pores. This large pore size allows rain water to drain readily and dry quickly after rain stops. The RF lossy coating is not affected by repeated exposure to rain. C-RAM ODP is dimensionally equivalent to the corresponding grades of C-RAM SFC. The reflectivity characteristics are identical to those of C-RAM SFC. C-RAM ODP is a very resilient material. It stands up well to moderate physical abuse and tolerates repeated deformations without tear or cracks. C-RAM ODP is processed using a fire retardant saturant, however it does not meet the NRL 8093 test #1, 2 and 3 for fire retardancy. Consequently the product is not recommended for indoor usage. 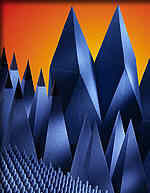 C-RAM EVA is a series of very high performance pyramidal absorbers suitable for exterior usage and capable of handling relatively high power densities. Being a very porous material, C-RAM EVA is used in anechoic chambers to cover air ducts, thereby reducing RF reflections. C-RAM EVA is made from a very light, open cell foam with large cell size of 15 pores/inch. This large pore size allows rainwater to drain readily, drying quickly after the rain stops. 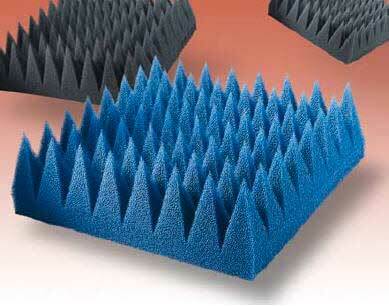 The RF lossy coating on the foam absorber is not affected by repeated exposure to rain. The large open cells permit forced air circulation through the material increasing the power handling capabilities to approximately 10 W/in² of RF power . Without forced air cooling, the material can typically handle 2 W/in². C-RAM CFC is a series of high performance broadband RF absorbers designed for electronic and aerospace clean room applications. The carbon loaded foam is completely embedded in a clean material, so there is no dusting or release of conductive particles. C-RAM CFC is made by embedding the corresponding grade of C-RAM SFC Pyramidal absorber in a mating section of expanded polystyrene foam, and sealing the back with a polyvinyl chloride plastic film. The completed box is sprayed with a light blue antistatic coating, which can be wiped clean and requires no special vacuuming to maintain clean room conditions. 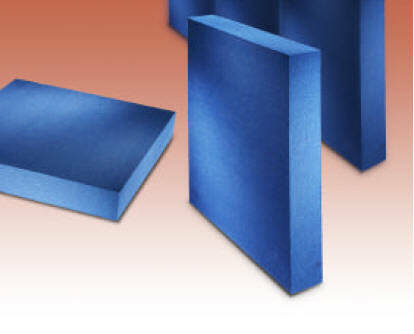 C-RAM-CB Corner Block is a carbon loaded urethane foam material used to fit anechoic chamber materials, such as C-RAM SFC, into the corners and edges of the chamber. TC-RAM Corner Block is a carbon loaded urethane foam material used to fit anechoic chamber materials, such as C-RAM SFC, into the corners and edges of the chamber. These products meet all of the fire retardancy requirements of NRL Specification 8093. 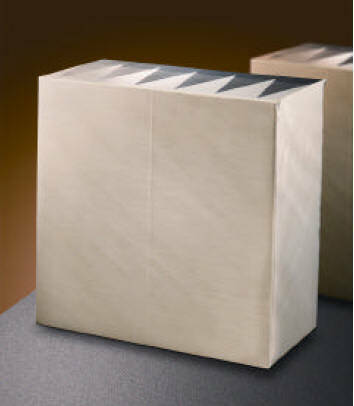 C-RAM Corner Block is made of the same material as the pyramidal absorber it is being used with. It will have the same density and impedance as the C-RAM SFC foam.